No reviews in for this one either. I enjoyed this one very much, Arthur was well out of his comfort zone at the other side of the world. Arthur had the inheritance spent before he even got to oz, he certainly knows how to live the high life. The tips to the hotel staff ensured he was treated with kudos by all staff, he really was living the dream on the back of this inheritance, I mean it's not like anyone else could claim it, could they? A very enjoyable episode which injects a bit colour to the series, the only thing which lets it down was Arthur was in trouble down in Oz and no appearance by Terry to help, even a cameo would have been a nice touch. I wonder if Dennis regrets not having one final episode just to tie things up, I would have been surprised they didn't ask him. 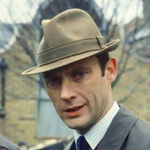 Small piece from the Sydney Herald on Minder in town filming. My voice of authority inside Australia reliably informs that above article appeared on Sunday February 16, 1992 in said newspaper. 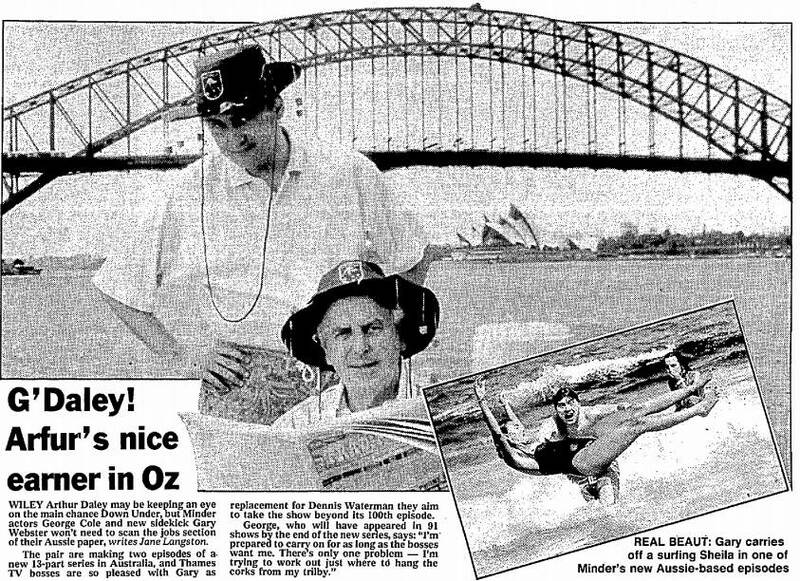 IT TOOK 'Er Indoors to finally convince Arthur Daley to head for the Great Outdoors - all so he could be upstaged by a kangaroo. Arthur's alter-ego George Cole, hates travelling. So wife Penny had to be pretty persuasive before he ventured into the Australian outback to film this week's episode of Minder (ITV, Thursday, 8.30pm). And once there, he found that a kangaroo was on a nicer little earner -the going rate for a trained roo was pounds 5,000 a day. '''We only wanted the animal for a couple of seconds of screen time - and it still cost us a small fortune," says executive producer John Hambley. ''Kangaroos are virtually impossible to train and he was more trouble than he was worth.'' Which is probably how Penny Cole felt when trying to convince George to venture Down Under. ''I don't like going away at all - not even on holiday. The family go without me,'' says George, who prefers to put his feet up at his rambling Oxfordshire cottage. In this week's episode, Arthur is lured to Australia by the smell of money when a long-lost relative dies -and cousin Ray (Gary Webster) tags along in case of trouble. 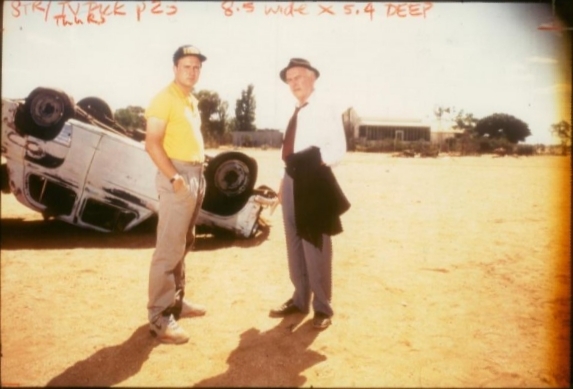 The pair (right) had to sweat it out for days in the outback mining town of Broken Hill, 700 miles from Sydney, with most of the filming done in temperatures topping 100 degrees. ''It was absolute hell,'' says George, who had to share scenes with a camel and a black widow spider - as well as that kangaroo. The funny thing about the episode is, Broken Hill is a good ten hours straight drive from Sydney, yet they make it look like it take about half an hour to get there! Agreed yoyo - I would think your viewer down under is going to get that far quicker than us over on the other side of the world though. 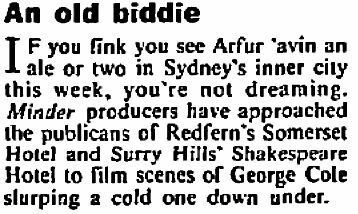 I got the feeling that after doing this George Cole wasn't entirely sure that it was a good idea going down under with Minder. I'm sure on the DVD commentaries there is a sense that this took them out of their natural environment too much from what I can gather. I have to say that as a fan and viewer I disagree with this opinion. Just as with 'Minder On The Orient Express' - a removal from their natural manor environment is nice now and again. It shows us how the characters interact with Joe Public that they have very little to do with the rest of the time and I most certainly enjoy the Australian episodes. When my Aussie ex first found out I was a minder fan, the first thing she mentioned was how funny the Aussies found the "half hour trip" to the outback was! I just watched this and was disappointed.. Arthur being so far off the manor should have been much better. Rather than just being out of his element and trying to cope Arthur just seems stupid. George Cole's performance is up to its usual high standard but he's let down by the script. The location filming, especially outside of Sydney is well done. I've just watched this for the first time, think I may be in the minority but I didn't enjoy it all. Don't leave me, I'll suffocate, I'll get hydrophobia. I think the location change was good and showing Arthur could earn a crust anywhere in the world if he had to flogging whatever he had to, was GC gold.